← Green peas or white peas: take your pick! Although the recipes of our Cookbook of Unknown Ladies were compiled during the Georgian period, quite a number of the dishes made their first appearance further back in history. 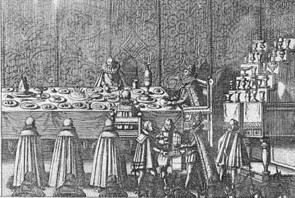 We’ve already seen how tort de moy graced the table of James II at his coronation feast in 1685. Other recipes have even earlier origins. Yesterday’s green pea soup or the kidney Florentine prepared at our Cooking Up History session would not have looked out of place at a Tudor banquet. As a literary device, food encapsulates a range of significant meanings throughout Shakespeare’s plays and poems. For example, food is used metaphorically to express an extremity of feeling or longing, such as Bullingbrook’s declaration in Richard II, wherein he describes his time wandering in exile as: “Eating the bitter bread of banishment” (III.i. 21). This evocative turn of phrase immediately sets a taste in the mouth and gives us, as readers, a profoundly intimate awareness of the character’s depth of feeling. Shakespeare’s creative use of familiar food items in this and other passages are both philosophical and sensuous. Food, in the shape of feasting and banquets, as in Macbeth, Titus Andronicus and The Tempest, provides the means of bringing people (and enemies) together, yet these occasions also serve a higher, and often darker, purpose. Banqueting, in these contexts, becomes a dark ritual. The act of ‘breaking bread’ facilitates the revelation of a horrid truth and the recognition of crimes committed. Food is also used as a distraction, such as Richard of Gloucester’s odd request for strawberries in Richard III (III.iv.1984). A skillful manipulator, Richard keeps those around him on their toes and always guessing. His call for strawberries serves as a brilliant delaying tactic as he and Buckingham solidify their plans and alliances. A’ Marian’s nose looks red and raw. 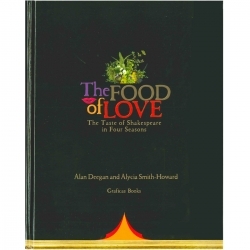 While conducting research for our Shakespeare cookbook, The Food of Love: The Taste of Shakespeare in Four Seasons, Chef Alan Deegan and I pored over age-old recipe books, and trawled through dusty archives to uncover the food that Shakespeare would have known and enjoyed. It was humbling to encounter the scrawled notes of countless, nameless “Greasy Joans” to whom we owe debt of thanks for preserving and passing on our culinary heritage. It is also what makes projects such as The Cookbook of Unknown Ladies so important. It is essentially a chronicle of the commonplace concerns and knowledge of common folk. 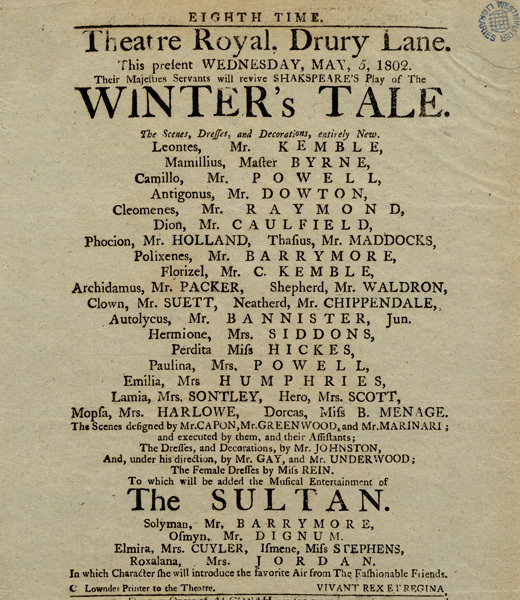 Shakespeare’s autumnal comedy, The Merry Wives of Windsor, is unique among his works as the one play that is focused exclusively on the everyday lives of ordinary, middle class, Elizabethan folk. 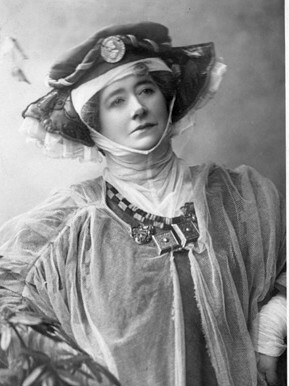 The play’s two principal characters are the quick-witted Mistress Page and Mistress Ford. Like Greasy Joan’s simmering pot, the formidable Mistress Page reminds us of wonderfully filling foods that comfort us against a brisk chill: “Come, we have a hot venison pasty to dinner!” (I.i.178). Shakespeare’s most explicit (and delightful) “food as food” reference appears in The Winter’s Tale, where we are treated to an actual grocery shopping list! Clown. Let me see; what am I to buy for our sheep-shearing feast? Three pound of sugar, five pound of currants, rice,—what will this sister of mine do with rice? But my father hath made her mistress of the feast, and she lays it on. I must have saffron to colour the warden pies; mace; dates?—none, that’s out of my note; nutmegs, seven; a race or two of ginger, but that I may beg; four pound of prunes, and as many of raisins o’ the sun. Perdita’s extraordinary sheep-shearing feast is only outdone by the celestial celebration in Shakespeare’s last, and some would argue, his greatest work, The Tempest, where he depicts a feast hosted by the great goddess Ceres herself (“Most bounteous lady of wheat, rye, barley, oats and peas!” IV.i.1771). The word ‘feast’ itself, in fact, appears over 100 times throughout Shakespeare’s plays. And, for me, Shakespeare has always been a feast for the senses. Samuel Johnson called Shakespeare’s works “a Map of Life.” Without a doubt, food is an essential part of the journey, and there are over 2,000 culinary references in Shakespeare’s plays and poems. Working alongside Chef Deegan to produce The Food of Love: The Taste of Shakespeare in Four Seasons afforded me the enviable opportunity to explore these references and the works of Shakespeare from a fresh and delectable perspective. And, what a delicious treat it has been! 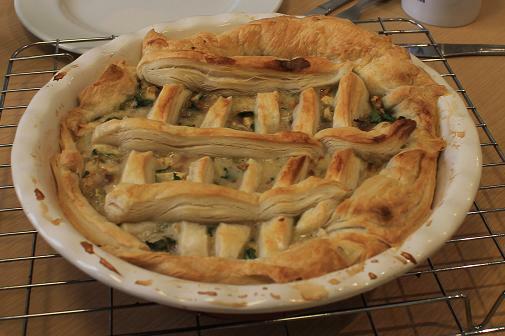 This entry was posted in History of food and tagged 16th century cookery, 17th century cookery, Alan Deegan, Alycia Smith-Howard, food and theatre, Food of Love, Shakespeare, Tudors. Bookmark the permalink.